A wedding without music and dance looks so pale and boring. Wedding DJs create a lively atmosphere which is sustainable enough for your guests for enjoying their time. These DJs play songs according to every ritual being performed at the wedding. 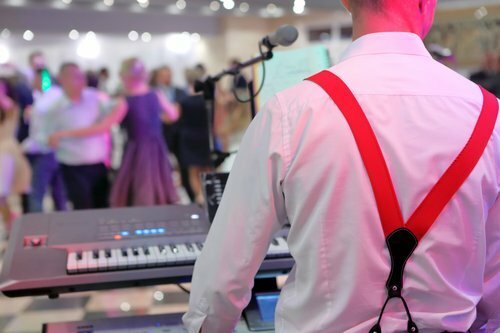 You can gain confidence when you appoint the right wedding Dj. It is better to experience higher prices and get good quality Dj services in return. However, on the other hand, you can get poor services if you pay a low price for hiring wedding DJs. There are various Dj companies that offer their customers good quality Dj services. This further ensures that your guests are enjoying themselves during the entire wedding ceremony. An important factor which is considered by a couple for hiring a wedding Dj is his personality. Most of the couples love to present themselves in a unique manner. This further prompts in hiring Kelowna Dj services having suitable attributes. Appointment of reputed wedding Dj services makes it simple for couples in organizing their wedding. There are a lot of couples who are under tight budget, organizing affordable Dj services instead of nuptial services. For experiencing a successful wedding you may require to hire professional wedding DJs. Various wedding Dj companies usually invest around fifteen to thirty hours per wedding. But you have to pay for just four hours. These companies invest a lot of amount of money on marketing, advertising, office space, education, insurance, music, lighting equipment, sound, etc. Some companies charge a lot of money for the services provided at weddings. However, Kelowna Dj services are not similar to birthday party Dj service. Wedding Dj services require customized soundtracks, more than three sound systems and a complete planning of the event. Why opt for music at weddings? Wedding DJs are experienced and have the knowledge of the sentiments and demands of a bride and thus enlightens her wedding ceremony nicely. Hence you can see that Dj is a very important part in wedding ceremonies and can enhance the occasion to a great extent.